The Town Hall, King's Lynn Historic SiteThe King's Lynn Town Hall (The Trinity Guildhall) is a truly magnificent building in King's Lynn. Dating back to 1421, when the Hall of the Trinity Guild was rebuilt after a fire, the Town Hall is the perfect venue for a variety of events. King's Lynn Town Hall has a host of rooms, each with its own historic story. Scratched on some window panes are the names of the plumbers and glaziers who replaced or cleaned the windows in the 18th and 19th centuries. The Coats of Arms either side of the window are those of the Town and the Butchers from the Shambles which was situated on the Saturday Market Place. Built in 1624 to replace wooden stairs on the outside of the Stone Hall. These rooms were completed in 1768 and the 6 chandeliers were purchased at the same time. Both rooms were restored in 1988 with their original 18th century colouring. The Card Room is dominated by the fine Rococo pier glass of about 1750. It's surmounted by a basket of fruit and foliate and ribbon swag decoration. It is made of Scots pine and recent restoration has revealed the original water gilding. Built in 1767 as the Council Chamber and used as a Magistrates Court from 1830-1982. Along with the Retiring Room it was restored in 1994. A rare example of a Victorian Court. Part of the new Municipal Building built in 1895. The oak panelling was originally Peacock Green, walls a rich terracotta and the ceiling a deep cream. Photographs in the Council Chamber are of Mayors prior to 1980 and those in the Crush Hall of a more recent date. We offer King's Lynn Town Hall as a Wedding Venue, Conference Centre, Party Venue, and also for Charity Events and Music Recitals to name but a few. Contact the Town Hall events team to discuss options for your event, or to request a brochure. 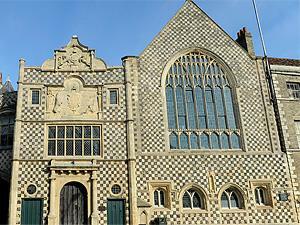 The King's Lynn Town Hall (The Trinity Guildhall) is a truly magnificent building in King's Lynn. Dating back to 1421, when the Hall of the Trinity Guild was rebuilt after a fire, the Town Hall is the perfect venue for a variety of events.